She is new to her school and new to her sport. But that isn't stopping her from beating out the competition and climbing in the record books. BALTIMORE, Md. — Caroline Trimble hasn't been at the track and field game long. She's already making an impression. “First year, freshman, first time ever doing track - to do what she did and definitely make an impact on the IAAM - there are coaches out there that are scared of her,” said her head coach Mark Planamente. The Catholic High School standout is excelling primarily at triple jump. She's ranked as the second best freshman in the state and rated as the 25th best freshman in the country. “I just started doing triple this year,” said Trimble. She placed third at the Interscholastic Athletic Association of Maryland Championshps in triple jump. She placed fourth in long jump. “For her to be of that caliber already, it's just unheard of,” added Planamente. Caroline also plays lacrosse and soccer. It was on the pitch where adversity struck last fall. Trimble's determination showed in her recovery and shines every day in the classroom. Just like Caroline in the air, her academic achievements certainly promise to rise. 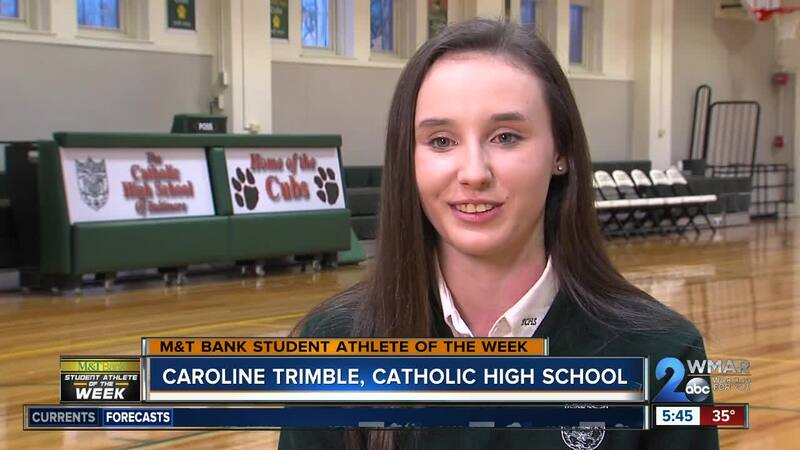 Congratulations to Caroline Trimble. She is the M&T Bank Student Athlete of the Week.